Have workers experienced a rise in job insecurity – defined as shorter hours, temporary contracts, and unstable working conditions – over the past four decades? This is no idle question. Debates around job security form one part of a larger discussion about the strategic orientation of the labor movement. Theorists such as Antonio Negri and Guy Standing identify a sharp rise in insecurity, or what is also called precarity (a term borrowed from the French), as a key feature of work and life in the present. On this basis, they argue that a shift in the form and content of class struggle must take place, or, indeed, is already taking place. One doesn’t have to agree with their specific proposals to see that their argument carries a certain force: given far-reaching changes in the composition of the working class, some sort of strategic shift is required. Under these conditions, it is no surprise that many socialists, seeking to defend a more or less classical orientation, have sought to deny that any such radical recomposition of the working class has taken place. Despite a mainstream consensus that employment is becoming more precarious, these socialists defend their views by insisting that there is nothing fundamentally new in the contemporary condition of the working class. If anything, they claim, we are returning to the sort of capitalism that prevailed during the laissez-faire era. Thus, in their view, the old strategies should apply more, not less. If it can be shown, on the contrary, that the conditions of the working class have radically changed, then we simply cannot re-apply the same inherited political strategies. Instead of justifying a return to old solutions, we will have to find new ones. Post’s conclusion is that, if feelings of job insecurity are rising, this is most directly an effect of the political “defeats of the last thirty years”: the advent of neoliberalism and the dismantling of the welfare state have made it possible for employers’ to undermine workers’ benefits, working conditions, job protections, and union organizations. Post is right to argue that job insecurity has always been a feature of working life in capitalist societies. The news media makes it seem as if new forms of insecurity are about to become the norm in the US, as if the majority of workers were about to end up employed at arm’s length in the so-called sharing economy (driving cars for Uber or working as Taskrabbits). The fact is that ostensibly novel forms of precarity – such as working for temp agencies and sub-contracting firms or as dubiously “independent” contractors – affect, as yet, only a small minority of workers. In this respect Post’s criticism of Guy Standing is judicious: the latter’s notion of a “precariat” exaggerates both the scale of this sector and its division from the the rest of the working class. It is also true, as Post emphasizes, that following the New Deal, the middle decades of the twentieth century saw a strong rise in employment protections and a concomitant reduction in job insecurity, which increased workers’ bargaining power. The risks associated with class struggle were therefore diminished. Today, massive declines in state-mandated and employer-provided protections have contributed to workers’ insecurity and reduced their combativeness. However, Post goes too far when he asserts that, while workers now pay a bigger price than in the past when they lose hold of their jobs, their hold on those jobs themselves is no more precarious than before. Unaccountably, Post misses the key to explaining rising precarity, today. It’s not just that the cost of unemployment has skyrocketed. The rate of unemployment has also risen dramatically. Not only has the probability that workers will lose their jobs therefore increased. The length of time it takes for the unemployed to find new jobs has grown longer, while the likelihood that the unemployed will have to accept jobs with worse working conditions has become greater. This is especially the case for those formerly employed in the manufacturing sector, which has shed millions of jobs. It is also true for youth who recently entered the labor force for the first time and, above all, for workers of color. The outcome has been the widespread collapse of workers’ bargaining power. The ongoing decline of employment opportunities helps to explain why so many workers are unreceptive to the organizing strategies of the past. As the labor market has become ever more forbidding, along so many dimensions, workers have felt their capacity to withhold their labor melt away, and with it, their capacity to resist their employers demands. Today, struggles are exploding around the indignity that, as far as capital is concerned, people’s work – and even lives – don’t matter. How does Charlie Post argue for his claim that precarious employment has not become per se much more prevalent? Post defines precarity as employment marked by “short-term, temporary, part-time work, at lower wages” and without “benefits.” He admits that more people are working part-time. Part-time workers made up a little less than 15 percent of all workers in 1968, rising to almost 20 percent today. 2 If other forms of so-called “nonstandard” employment are included, this share rises to 40 percent, or almost 60 million people. 3 However, Post points out, most part-time workers are not also less attached to their jobs: workers in fast-food and retail are “working sometimes ten or fifteen years for the same employer” but “can’t get full-time.” The implication is that businesses do still want to hold onto their employees; it’s just that refusing to employ workers full-time allows them to avoid paying for workers’ benefits. It is true that, on average, the length of time workers stay at their jobs has risen slightly, since around 1995. But this figure masks opposite trends. 4 On the one hand, since 1973, women’s attachment to the workforce has become more regular, with dual-income-earning households now much more common. Public-sector employment has also become more secure. On the other hand, men’s employment in the private sector has become much more irregular. Between 1973 and 1995, the average length of men’s private-sector employment declined by about 25 percent, controlling for changes in age and education. In 1973, half of men aged 35-64 had been in their private-sector jobs for at least 10 years, compared to a little more than one third, today. A substantial fall in job security for men is one part of a larger transformation of the employment landscape. Over the past four decades, the US workforce has seen also seen declines in employer-sponsored benefits and increases in inequalities among workers, in terms of wages and benefits. 5 Since 1979, the proportion of all private-sector workers with employer-sponsored benefits has fallen significantly: for healthcare by 24 percent and for pensions by 16 percent. By many measures, the working class is increasingly divided between a shrinking section of relatively secure employees and a growing section of precarious workers. The danger for those in the former group is that they can fall into the latter, if they fail to keep up with employers’ demands. How is this rising precarity to be explained? Post refers to certain long-term transformations in the US economy, which are key. He argues that precarity has vastly increased due to the decline of the welfare state and the adoption of neoliberal policies. Post rightly connects the rise of neoliberalism to a long-term fall in profit rates, which spurred an employers’ offensive against workers, and especially against poor workers. However, Post fails to note that, consequent on low rates of profit, this same offensive unfolded during an era of intense economic turbulence, marked by slowing rates of economic growth and, importantly, elevated levels of unemployment. Mapping out the trends associated with rising precarity is essential, but we should not mistake such symptoms for the cause. Whether workers have part- or full-time work, whether they stay at their jobs for a long time or face high rates of turnover, workers’ job security is ultimately linked to their ability to avoid falling into unemployment. In other words, their job security is tied to their capacity to find similar jobs, if they lose or leave their current ones. For this reason, a strong labor market will create room for workers to fight for improved conditions, while a weak market will do the opposite. Union membership does provide a big boost to workers’ power, regardless of labor market conditions. However, unions’ power is itself responsive to changes in those conditions. In a strong market, unions win big gains for members. In persistently weak job markets (with a few notable exceptions), unions tend to enforce austerity on their memberships. 6 If overall labor market conditions – more than part-time or short-term employment – make for insecurity, then the strength or weakness of the labor market is the yardstick by which, in the first instance, we should measure the extent of precarity. Precarity is thus determined, above all, by unemployment rates. 7 Between 1947 and 1973, the unemployment rate was 4.8 percent on average; after 1973, it rose to 6.5 percent. Since 1973, there has been one exceptional period, 1995-2001, when the unemployment rate returned to its pre-1973 level (that will be important, below). Excluding these years, the post-1973 unemployment rate rises to 6.9 percent, or 43 percent above the previous average. This rise is not only due to the fact that unemployment levels have been higher during recessions. Economic recoveries are increasingly jobless recoveries. Reductions in unemployment have taken longer every decade. Following the 1981 recession, it took 27 months for employment to attain its pre-recession level; following the 1990 recession, 30 months; following the 2000 recession, 46 months. After the 2007 recession, a labor market recovery took 6.3 years. The transformation in labor market conditions has had radically negative consequences for workers, since, in weaker job markets, the costs of job loss are more severe. Between 1984 and 2010, workers who were displaced and then found part- or full-time work saw wage cuts of 15 to 20 percent, on average. In strong labor markets, by contrast, those same costs are comparatively minor: so for example, in the strong market of the late 1990s, displaced workers who found new work saw cuts of little more than 5 percent; workers who found full-time work saw no loss of income. Here is the reason why workers feel so insecure, today: in a slack labor market, job loss has severe consequences, since it is much harder to find a new job to replace the job one has lost. Post’s notion that the increased insecurity of employment is a reflection of the rising costs of job loss – resulting from the “rise of neoliberalism and the dismantling of the welfare state” – rather than being an economic consequence of a rising precariousness of employment is thus profoundly mistaken. In fact, the counterposition is misleading. Pace Post, workers’ “attachment to employment has become more precarious,” making the weakening of state-mandated protections that much more severe. Because Post sees the degree of precarity as inversely related to the strength of welfare-state protections, he is led to argue that the present-day weakening of the welfare state, associated with neoliberalism, represent a simple return to the labor conditions that reigned before the welfare state came into existence. In other words, Post argues that conditions in the liberal Gilded Age and the neoliberal present are essentially identical, that they represent a “norm” for capitalism, interrupted only by the unusual climate that reigned in the aftermath of the New Deal. Post can embrace this identity between present and past only by ignoring certain stark differences. Since 1973, rising precarity has been associated not only with the decline of the welfare state, but also with a slowdown in capital accumulation, a rise in unemployment, and a decline in the availability of industrial jobs, all of which mark off the present from the Gilded Age past. Post denies the reality of both weakening growth and the historical novelty of present-day deindustrialization, asserting “that the percentage of workers employed industrially has been shrinking from the 1880s and 1890s.” Thus, he cannot recognize why precariousness has become such a distinctive feature of the present. To what extent do conditions of work and struggle, today, actually mirror those of the Gilded Age? Then, as now, rates of unionization were low and limited to skilled workers. With notable exceptions like the IWW, unions generally ignored the semi-skilled and unskilled. Meanwhile, there was no safety net for workers thrown out of work. These points form the basis of Post’s argument that the present is essentially like the past. In reality, US labor market conditions today are little like they were in the decades before World War I – and not only because in 1880, 50 percent of the labor force was still in agriculture. Major differences between the present and the past can easily be demonstrated by looking at real-wage trends for unskilled workers. Between 1880 and 1913, unskilled workers’ real wages rose by 1.5 percent per year. 11 Recall that for production and nonsupervisory workers, real compensation was stagnant between 1974 and 2007. How was it possible for unskilled workers’ wages to rise so quickly, back then, in spite of an absence of unions and social protections? One reason is that labor markets were tight: this was an era of labor under-supply in the US. Many whites still had access to land. Meanwhile, indigenous populations had mostly been eradicated. Racist factory-owners in the North were loath to attract Black sharecroppers from the South, so, as the economy boomed, huge numbers of immigrants were pulled in from Europe. Post argues that “in the 1890s, the vast majority of working people lived an incredibly precarious existence,” but that was much less true in the US than it was in Europe. Immigrants came to the US precisely to escape much higher levels of precarity. Around the turn of the century, this country saw one of the largest mass migrations in history, yet real wages for unskilled workers continued to rise. On this basis, one can argue that, in certain limited respects, the liberal period, 1880-1913, was more like the age of managed capitalism, 1949-73, than it is like the present. In the former two periods, US labor markets were tight and real wage growth was strong; today, the labor market is slack and wage growth has stagnated. 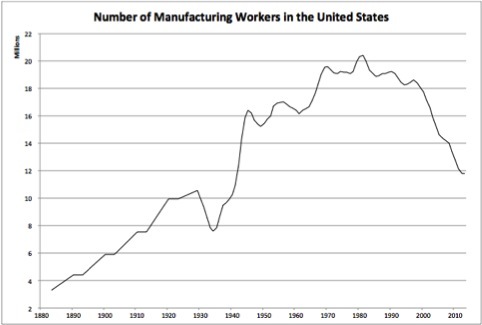 This is not even to mention other major differences between the late 1800s, when workers’ struggle was still largely defined by the fight to increase workers’ control over production, and the present, when workers’ loss of control has been pushed to the extreme for all but a tiny minority of high-tech engineers. Nor is it to mention that back then, the industrial workforce was still expanding, as compared to today, when it is shrinking. What explains variations among historical periods in labor market strength? The answer is simple: persistently strong economic growth leads to tight labor markets, improvements in workers’ bargaining power, and reductions in precarity, while persistently weak economic growth leads to slack labor markets and rising precarity. 12 Thus, to explain why labor markets have weakened since 1973, we need to figure out why the US economy has become increasingly stagnant. The best account of this tendential stagnation remains Robert Brenner’s Economics of Global Turbulence. At the beginning of the postwar period, the US economy was unparalleled in size and strength. Nevertheless, fearing a return of economic depression and the spread of communism, the US used its economic might to support reconstruction of its former economic competitors in Europe and in Japan, as well as their integration into the world economy through free trade. This integration created the conditions for a long economic boom. However, the resulting expansion of European and Japanese production did not complement US production. Instead, those countries produced an increasingly similar mix of manufactures, making for growing redundancy in international markets. With lower wages and undervalued currencies, efficient producers in Europe and Japan were eventually able to flood US markets, outcompeting US firms. The result, in the mid 1960s, was rising economic turbulence. By 1971-73, the prevailing international monetary order had collapsed: the US forced a revaluation of Japanese and European currencies against the dollar, in order to even the economic playing field. At the same time, US employers undertook a massive campaign against workers, which Post describes in his interview. What Post does not say is that all these efforts were only partially successful: in the end, global overproduction persisted. The consequence was a long downturn in economic growth rates across high-income countries: GDP per capita growth rates for those countries fell from 4.3 percent per year, on average, in the 1960s to 2.8 percent in the 70s, 2.3 percent in the 80s, 1.8 percent in the 90s, and 1.2 percent in the 2000s. 13 One consequence of ever slower growth was higher levels of unemployment and so also worsening working conditions. This worsening was certainly mediated by workers’ degree of organization and by the extent of social safety nets. However, in no case did these turn back overall trends. 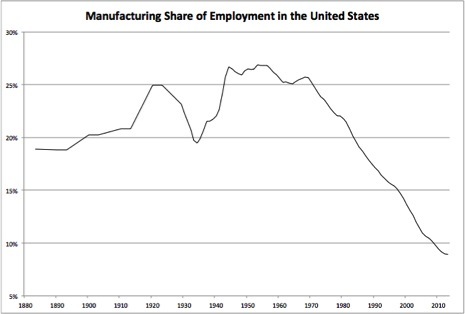 On this basis, it is easy to understand deindustrialization, defined as an ongoing decline in the manufacturing employment share. “The reality” is not that “the percentage of workers employed industrially has been shrinking since the 1880s and 1890s.” On the contrary, this percentage rose into the early post-war period. Meanwhile, total manufacturing employment expanded until the mid 1960s, when the US market was flooded with European and Japanese goods. It was at this point that deindustrialization set in. In fact, beginning in the early 1970s, with the start of the long downturn, deindustrialization became common across all high-income countries. Recall that this downturn had been centered in international markets for manufactures; we can see the effects of that, statistically. In the US, output growth rates in manufacturing fell more substantially, in the downturn, than they did in the economy as a whole. Before the downturn, manufacturing growth was 10 percent faster than overall economic growth; afterwards, it was 20 percent slower. No growth-engine replaced manufacturing: GDP growth was almost 40 percent lower in the years after 1973. This quantitative reduction in economic growth rates produced, as an effect, deindustrialization, a qualitative transformation in employment. Due to global overproduction, US manufacturing output growth rates fell substantially. Meanwhile, productivity levels rose slightly: in order to maintain their positions in more competitive markets, firms had to raise productivity levels, regardless of depressed conditions. As a result, it was now possible to meet all of the increase in the demand for manufactures while significantly reducing the manufacturing workforce. Deindustrialization is surely a matter of “mechanization,” as Post suggests. But he stops short of providing a full account. Deindustrialization is a matter of mechanization taking place in the context of severe constrictions on the growth of output, as occurred during the long downturn. Where does all this leave us with regard to the question of precarity? Is there a specifically precarious “layer” of the workforce, or is precarity generalizing across all workers? The answer is yes, both statements are true. In a weak labor market – and when workers are under attack by neoliberal policy changes – the entire class is squeezed. Meanwhile, the layer of the class that works under distinctly insecure conditions expands. Is the latter an increasingly fixed layer? To some extent, it is. When labor markets are slack, it is harder for poor workers to fight their way out of precarious conditions. This is both a cause and a consequence of rising inequality. At the same time, extreme insecurity remains, for many, a temporary situation, whether that is a matter of life stages or of job loss during a recession. 1. ↑ All subsequent quotations from Charlie Post, “We’re All Precarious Now,” Jacobin Magazine, April 20, 2015. 2. ↑ All data from the Bureau of Labor Statistics (BLS) unless otherwise noted. 4. ↑ All data on employment tenure from Henry Farber, “Job Loss and the Decline in Job Security in the United States,” in Labor in the New Economy (Chicago: University of Chicago Press, 2010), eds. Katharine G. Abraham, James R. Spletzer, and Michael Harper, 223-62. 5. ↑ Data on precarity from The State of Working America website, http://www.stateofworkingamerica.org/data/. 6. ↑ The strike-wave that started in 1933, which led to the founding of the CIO, is an important exception, but it is worth remembering that John L. Lewis and the rest of the CIO leadership were already moving against strikes and pushing for compromises with both firms and Democrats by 1937. 7. ↑ Underemployment rates, which include involuntary part-time workers, as well as discouraged workers and so-called marginally attached workers, provide a fuller picture, but these are unavailable before 1994. Between 1994 and the present, underemployment rates have averaged 10.7 percent. 8. ↑ If their real wages are stagnating, workers face heightened pressures to accept all sorts of other abuses, as well: losses of benefits, increased risks to safety, sexual harassment, wage-theft, and so on. In a slack labor market, workers know that there are many others, just like them, who are looking for work and not finding it. Workers are thus less likely to leave their current jobs, even if terrible, to look for better ones, while unemployed workers are more likely to take the first terrible job that comes along. 9. ↑ During the 1949-1973 boom, incomes for the poorest workers rose faster than those of the population as a whole. 10. ↑ In this context, it is worthwhile to mention Marx’s arguments regarding the deformation of labor markets under conditions of a low demand for labor. In Capital, Marx discusses the expansion of a “surplus population,” whose attachment to labor markets becomes more precarious, even as society becomes more wealthy. Marx points out that the surplus populations of his day made ends meet in a variety of ways: by returning to the countryside, by floating in and out industrial work, or by funneling into super-exploited sectors, such as domestic labor. The point is that workers’ responses to slack labor markets cannot be neatly summarized in one statistic. 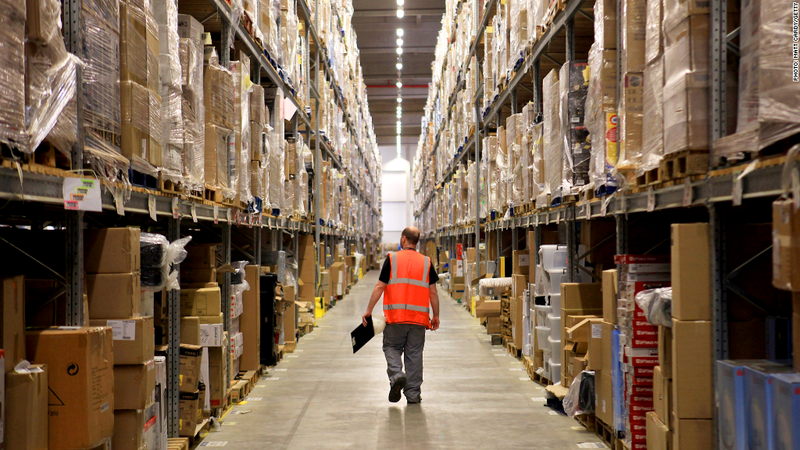 As in Marx’s time, so too, today, there is a dynamism to precarity: workers respond to poor prospects by working part-time, working multiple jobs, changing jobs frequently, or simply by resigning themselves to low-paying jobs in Walmart-like conditions. They also return to school, join the army, and work informally or illegally. Sometimes, precarious workers respond to poor prospects differently, by taking direct action, thereby forcing wages upwards and improving their working conditions. 12. ↑ An exception is found in countries with large peasant populations, and thus high levels of disguised unemployment. Then, there may be no real wage growth, in spite of economic growth. Instead, there is a massive transformation in the economic structure, shifting the workforce from agriculture to industry and services. That has not historically been true in settler-colonial countries, like the US, where the common problem is labor undersupply. 13. ↑ Calculated from the World Bank’s World Development Indicators. 14. ↑ We in Endnotes have written elsewhere about how transformations in the employment structures have affected the character of class struggle, but I will refrain from reciting these arguments here. See, for example, “The Holding Pattern,” and “A Rising Tide Lifts All Boats,” both from Endnotes 3. Aaron Benanav is an editor of Endnotes.